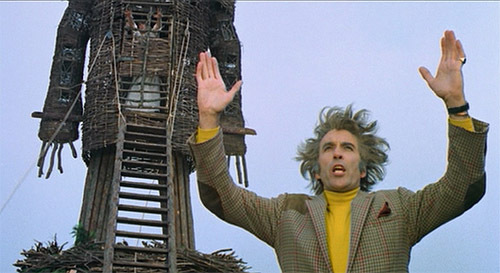 I’ve always wanted to see the 1973 drama/thriller/sorta-horror classic The Wicker Man, and it ended up being a rollickingly fun watch for last week’s summer solstice. In the film, straight-laced Sergeant Howie is dispatched to investigate the disappearance of a young girl named Rowan Morrison on Summer Isle, a remote Scottish island, only to find that not only does every villager on the island deny any knowledge of Rowan Morrison, but that his visit coincides with the island’s highly enthusiastic and – to the devoutly Christian Howie – unwholesome May Day preparations. Cue an increasingly frenzied search by the valiant but humorless Howie, a collision of equally blind faiths, and more references to to Celtic folklore and fertility symbolism than you can shake a Maypole at. There’s an inn named the Green Man; a sweet shop stocked with pastries and chocolates in the shape of women, leaping hares, and what look like rams’ heads; lots of nubile gamboling in graveyards and stone circles; a lush estate encircled by phallic topiaries… Oh, and Christopher Lee as the island’s erudite neo-pagan lord, who enjoys nothing so much as wearing a kilt and soliloquizing about the joys of the animal world while intercut with footage of glistening snails intertwining and set over a soundtrack of hypnotically pulsating drums and recorder. No, I didn’t have too much fun watching this movie, I don’t know what you’re talking about. While I was, in fact, having too much fun to be properly reverent, and so didn’t actually find the film all that tense or frightening (sadly), there were a number of moments of horror that I admired and enjoyed – they hit about the same note of surreal absurdity as the ghostly scenes that Wendy glimpses when she’s trying to escape the Overlook in Stanley Kubrick’s The Shining, for example. The contrast between the islanders’ serene self-assurance and Howie’s outraged morality and growing helplessness is wonderfully effective in this regard. (I particularly loved one scene in which Howie stamps through the island’s churchyard, aghast at the graves’ desecration, only to encounter the further discombobulating sight of a nursing mother perched on top of a gravestone and smiling beatifically as she balances an egg in one outstretched hand.) And the fever-pitched climax is just unmissable. For all the film’s lack of subtlety in other respects, I found the clash-of-faiths subplot surprisingly nuanced. There’s something particularly interesting in the island’s backstory, and the related mini-twist that Howie attempts to reveal to the islanders in the last few minutes of the film. (Ergh, attempt at spoiler-free analysis.) It’s relevant to the question of who, if anybody, the film seeks to punish in the end, and why. In Howie’s case, his hunger for a (to him) rational, just resolution of events leads him into an act of tragically desperate-for-heroism-to-be-the-answer heroism; he ends up being punished for refusing to believe in a world that’s unlike the one he wants to believe in, and for refusing to act other than according to his principles, which is stupid or admirable or both, depending on how you want to look at it. When it comes to the islanders, the film holds to a surprising degree of moral relativism. Even as the film uses their fanaticism to create alienating horror, the backstory nudges the viewer towards the realization that the islanders are themselves victims of a dishonest system. Ultimately, I think the film tries to move the audience towards horrified sympathy for Howie and the islanders alike, regardless of the extent of their complicity in their respective victimhoods. If anywhere, guilt is most solidly placed on the shoulders of the too-knowing Lord Summerisle (Lee), who seems to have a mostly aesthetic and philosophical appreciation of Summer Isle’s faith, and – one assumes – of the luxury that it brings him. Even as the film revels in his charisma and cultured elegance, it’s also mistrustful of them – Sgt. Howie may have a one-track mind, but hey, at least you can trust him to be straightforward. 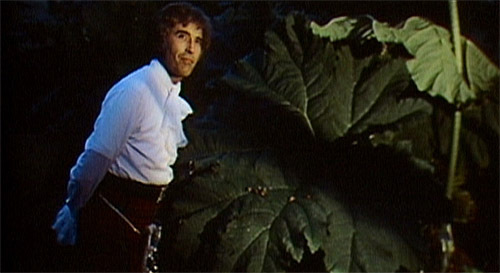 Lord Summerisle’s subtlety and sophistication, by contrast, make him all the more culpable in his suggested eventual fate – “you actually got yourself into this one, you possibly agnostic hedonist you.” Any moral or ethical prescription in the film points more strongly at the evils of faith-based manipulation than at failure to critically examine one’s beliefs. In that sense, the film actually seems to stand on the side of faith over worldliness, which seemed a surprising conclusion for a film ostensibly about the dangers of fanaticism. In any case, if you have any interest whatsoever in lavishly produced semi-musicals about Celtic fertility rites, I highly recommend this movie. Lord Summerisle would love your company. I have never seen this and the family I’m staying with would be extremely horrified by it, but I just had to say: Yay Christopher Lee! Oh, Christopher Lee. I want to marry his voice. I think part of the fun of his character in this movie is the extent to which he’s obviously entertaining himself by hamming it up. Yes–and he was perfectly cast for Saruman (which sounds mean but isn’t meant to). I’ve been re-reading Lord of the Rings and was struck by how much he captured the essence of that character. And of course, he reads the books every year and has met Tolkien, which is just cool. No, I completely agree – he was one of my favorite casting choices for the films. (On the visual front, I love that he even has the black eyebrows + white hair thing going on.) And I didn’t know he had met Tolkien – +500 points! Do you have recommendations for any of his other films in particular? I still haven’t seen many. Oh, I love The Wicker Man. It’s such a classic! 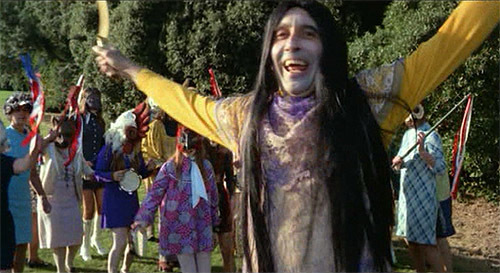 I’m a big fan of The Wicker Man, one of the most original thrillers ever. My one quibble is that I don’t see how the islanders, in a world without the internet, could have found out so much about Howie(how the f— could they know he was a virgin?). For Emera’s sake, I hope she missed the unspeakable 2006 remake with Nicholas Cage; an atrocity that made me want to burn the director, screenwriter, and producer. Hah!! I have to say that never even occurred to me – I guess I operated under the foggy assumption that it’s the sort of thing that fertility cultists would be good at ferreting out, one way or another. Maybe they maintain a clandestine world virginity directory for such purposes. I have to admit to watching a couple of clips from the Cage remake because of how hilariously horrendous the whole affair sounded. BEES!!!! And the release of 40-Year-Old Virgin stirs an ecstatic panic – such a perfectly seasoned specimen, gone to waste; where can we find another one?! You tore into Lovecraft for his incorrect use of semi-colons. Thank you, kind lady, for not pointing out my own.